Cigar-tasting therefore means smoking the cigar and smoking takes time; depending on the type of cigar the entire session may last fifteen minutes or more than an hour, and at each stage of the tasting session the characteristics of that stage must be noted. We will therefore return to the tasting we began earlier where we left off, i.e. at the stage where the cigar is selected. We will now explain in detail the various factors to be evaluated, defining the characteristic under scrutiny and the vocabulary used to describe it. Shape: check the shape. If, like most cigars, the shape is cylindrical, check the regularity of the cylinder. Check the shape of the head: the head may be hemispherical, flattened, twisted or pointed. Check the cut of the foot: the foot may be cut at right-angles to the cigar or it may be cut at an angle. Is there any tearing? Rolling of the wrapper: has the wrapper been evenly rolled or are there any cracks? Appearance of the wrapper: check the colour for regularity and any variations in colour with the successive windings. Check for any coloured blotches; check the grain quality and the shiny or dull appearance. Check any differences in firmness along the cigar; a common fault when rolling a cigar is to overfill the ends in order to close the cigar. Cigars with this defect may be on the hollow side towards the middle. The need or taste for smoking is related to the absorption of nicotine. The nicotine reaches the brain after a maximum 10 to 15 minutes; an hour later virtually all the nicotine is eliminated. The smoke from air-dried tobacco (i.e. 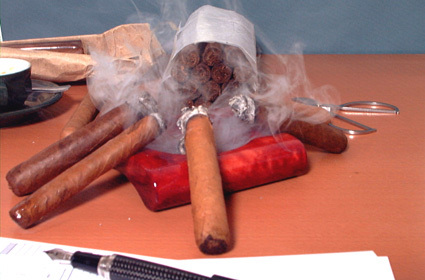 cigars and dark tobaccos) is alkaline; the nicotine passes into the bloodstream through the walls of the mouth. There is no need to inhale. The smoke from so-called "bright" tobaccos, on the other hand, is acidic and smokers need to inhale the smoke to absorb the nicotine though the walls of the bronchi. Compactness: a good cigar should be firm, i.e. well-filled but pliant. 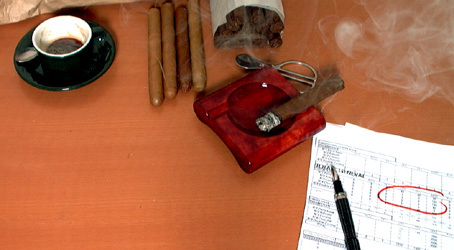 An over-firm cigar will be difficult to smoke while a flabby cigar will draw too easily. The characteristic smell of a good cigar is its first attraction. The cigar-lover should learn to prolong this pleasure and intensify it by holding the unlit cigar in the mouth for a long time. With the cigar cut, the smoker should gently smell the air that gradually fills the nose and mouth with all the aromas of the tobacco. The exquisite sensations experienced while "smoking raw" give vital information as to the body and richness of the smoke once the cigar is lit. 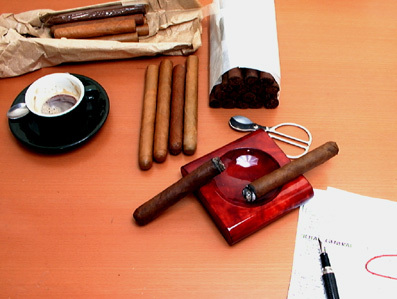 In addition, these few minutes of contact with the hand and mouth prepare the cigar for lighting. Draw is such an important factor in the pleasure experienced when smoking that it should be judged in two different ways: indirectly in terms of the compactness of the cigar, and directly in the mouth. 1) Combustion: the regularity with which a cigar burns along its entire length is one of its essential qualities. Irregular burning is a sign that the tobacco is uneven. The shape of the burning surface is a sign of how well the cigar has been made: in a perfect cigar this surface will be flat; the surface will be convex if either the wrapper or the binder burns too fast. If the wrapper or the binder burns too slowly, the burning surface will be concave; this is an extremely serious defect. Some cigars may have a tendency to go out, revealing insufficient overall combustibility. - bitter: very common, particularly in certain varieties of tobacco, notably those from Indonesia. We would point out that a slight sweetish flavour may not be unpleasant. This is, of course, a matter of personal preference; it is, however, also related to the overall balance of sensations. Slight bitterness is usually acceptable, even welcome; acidity, however, is always perceived as a defect. a) Richness determined by the variety and quality of the aromas. The words "rich", "generous" or "heady" may be used to describe a smoke with a wide range of aromas. These adjectives express the richness and fullness of the aroma. The use of the word "heady" to describe cigar smoke should not be confused with the same word used to describe a wine: a "heady" wine is one that is high in alcohol, i.e. a wine which "goes to your head". The opposite of a rich smoke may be described as having an aroma that is "poor", "thin" or "flat". b) Intensity, which is a measurement of the density of olfactory substances and nicotine in smoke. Words such as "filling", "full", "warm", "" substantial", " full-bodied" or "satisfying" may be used to express intensity, while its opposite may be expressed as "hollow", "weak", "short", "shallow" or "thin". c) Character: a very personal judgement of the pleasing qualities of the smoke. The smoke from a good cigar may be described as "elegant", "distinguished", "graceful", "amiable", "stylish" or "racy", while that from a poor cigar is "indifferent", "dull", "flabby", "ordinary", "common"... even "vulgar"! d) Balance: this is the supreme quality in a cigar whose various constituents combine perfectly. Where balance is perfect the cigar may be described as "harmonious", "mellow", "rounded", "flowing", "complete", "balanced", "creamy" or "velvety". Lack of balance may be described as "jarring", "heavy" or "unbalanced". e) Persistence: this word, borrowed from the perfume industry, is used to describe the ability of an odour to prolong its presence. But no smoke is capable of persisting without changing for the worse; and persistence combined with intensity is a defect. Smoke should have "presence" but disappear rapidly. In a word, discreetly. WHICH AROMAS ARE FOUND IN WHICH VINTAGES? 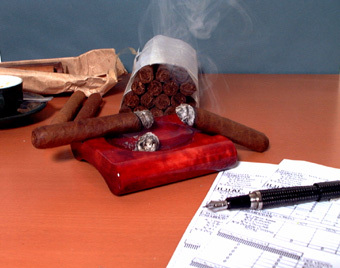 Tasting notes on the main vintages of cigar tobacco are given later in the present work. For the moment we will give a broad outline of the flavours listed above, indicating which vintages and which cigars are normally characterised by them. These odours are present in the smell of tobacco and in the smoke of cigars with a medium to weak body such as Dominican, light Cuban (mown hay), Manila, Java (wet hay) with touches of eucalyptus and a variety of floral notes. The degree of humidification has a significant effect on the nature and character of plant sensations: if a cigar is too dry, its odours will tend towards smells of straw or even paper; if it has been well humidified it will have rich floral notes; if humidification has gone too far the smell will be of sour hay and there will be a burning sensation. Closely related to plant odours, woody odours have a great olfactory presence and a tendency towards plant juices, resins, saps and liquorice. They are found in indigenous tobaccos known as "criollos" and their derivatives: Olor dominicano, Honduran criollos tobaccos, the rather coarse tobaccos from the Partido and Vuelta Abajo areas of Cuba. Peppery notes are often present in tobacco and in unlit cigars. Hot pepper is very present in the smoke of full-bodied Cuban cigars, sometimes mingling with notes of green capsicum and nutmeg. From this point of view, Honduran cigars are closely related to Havana cigars; in contrast, the presence of pepper in Dominican cigars is often blended with honeyed sweetness. All the animal notes detected in cigars are as a result of ammoniated by-products of fermentation. When fermentation is only partial the ammonia is too harsh on the nose but in small quantities it produces rich odours of the stable, sometimes of sheep or musk; the latter are very apparent in fine Havanas. The classic cigars of Nicaragua as well as the coarser Cuban varieties have these odours with a vengeance, sometimes accompanied by notes of camphor and iodine. Some very refined cigars, particularly certain Cuban cigars in which the body is not too full, have fine notes of leather-goods. These odours come from the sugars present in the plant. Depending on the degree to which they have been heated they can give off sweetish, even sickly, flavours of honey, milky smells and an entire palette of odours ranging from caramel to roasted, even toasted smells. Dominican cigars smell of gingerbread with notes of vanilla and milk products while coarse Havanas evoke toast and chicory. Honduran cigars can give of burnt smells while their Jamaican cousins can evoke dairy products. And finally, Brazilian cigars evoke milky caramel and cocoa. The smells of the earth that fed the plant give it a characteristic "earthy" taste that is always somewhat "rustic" but never lacking in charm. When Dominican cigars are made primarily with Olor Dominicano tobacco they have a characteristic smell of mown hay. Coarse Cuban cigars have heavier earthy smells while Honduran cigars often have an earthy taste that can become too pronounced if the cigar is too dry. This last point holds good for all cigars.